The Cost of a Long Life in the U.S.
There’s an interesting article I came across at the UC Atlas of Global Inequality website. If you’re at all interested in the rising cost of health care in the U.S. as compared with the rest of the world, or you’re interested in how the amount of money spent on health care correlates with life expectancy… then give the article a read. As the chart of health care spending per person shows (below), the countries in the highest quintile (20%) spend more than 16 times the amount spent by the lowest quintile. The highest 5% of the countries spend 4492% of the lowest quintile. This is after adjusting the per capita spending rates to international dollars (to account for Purchasing Power Parity), and includes both government and personal expenditures. Despite the wide gaps, higher spending on health care does not necessarily prolong lives. In 2000, the United States spent more on health care than any other country in the world: an average of $4,500 per person. Switzerland was second highest, at $3,300 or 71% of the US. Nevertheless, average US life expectancy ranks 27th in the world, at 77 years. 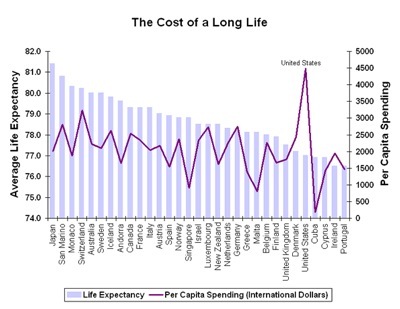 Many countries achieve higher life expectancy rates with significantly lower spending. The chart below shows the top 30 countries in the world ranked by life expectancy. The red line indicates per-capita health expenditure (right axis), and shows that many countries outperform the US with approximately half the spending. I believe that a huge reason for the spending discrepancy between the US and other countries can be summed up in two words: preventative medicine. We Americans (for the most part) want to live longer despite our poor eating habits, lack of exercise, and otherwise unhealthy living. This requires more intervention from the health care system through hospitalizations, prescription drugs, etc. For the most part, other countries focus on preventative medicine, are less overweight, and live longer due to a healthier lifestyle which requires less medical intervention. Agree or disagree if you like. This is just my observation through 3 years of pharmacy school. What AJ says is very true, however health insurance companies in the US will not pay for preventative medicine. It’s hard enough getting them to pay for life saving procedures & prescriptions!